The George Douglas Papers are ready for researchers. An updated finding aid and digitized selections from the collection are now available on DigitalCommons@ACU. Photocopy of endorsement from congregation at Sylvana Church for George Douglas, 1883, box 1, George Douglas Papers, 1830-1939. Center for Restoration Studies MS #5. Abilene Christian University Special Collections and Archives, Brown Library. Abilene Christian University, Abilene, TX. George Douglas served in the Confederate Army during the Civil War. 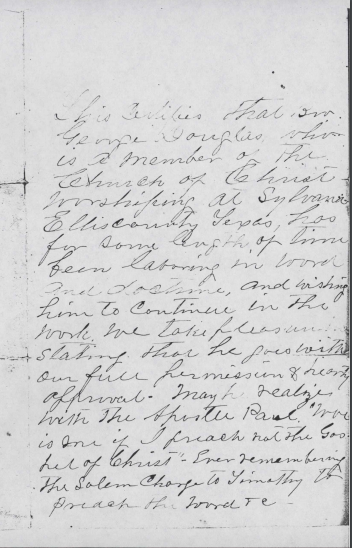 Photocopy of sermon notes of L. Douglas, 1883, box 1, George Douglas Papers, 1830-1939. Center for Restoration Studies MS #5. Abilene Christian University Special Collections and Archives, Brown Library. Abilene Christian University, Abilene, TX. These papers contain photocopies of documents belonging to George Douglas, including a Civil War journal describing the battle of Sabine Pass, Texas, a land grant certificate from the governor of Texas, and two photographs of Douglas. 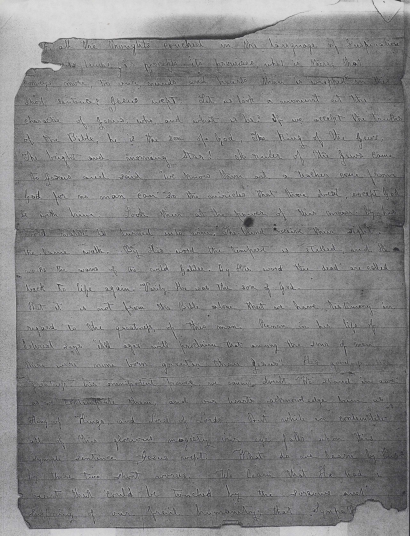 Also included are photocopies of the day book of Nathaniel Lynn Douglas beginning in 1830, loan and legal papers for the Douglas family, and correspondence between Douglas family members. Campbell, Alexander, “Address on War” (1970). Stone-Campbell Books. 128.